Hepatitis Monthly - The Risk of Hepatocellular Carcinoma After Directly Acting Antivirals for Hepatitis C Virus Treatment in Liver Transplanted Patients: Is It Real? The Risk of Hepatocellular Carcinoma After Directly Acting Antivirals for Hepatitis C Virus Treatment in Liver Transplanted Patients: Is It Real? To Cite: Strazzulla A, Maria Rita Iemmolo R, Carbone E, Concetta Postorino M, Mazzitelli M, et al. The Risk of Hepatocellular Carcinoma After Directly Acting Antivirals for Hepatitis C Virus Treatment in Liver Transplanted Patients: Is It Real?, Hepat Mon. 2016 ; 16(11):e41933. doi: 10.5812/hepatmon.41933. Introduction: Since directly acting antivirals (DAAs) for treatment of hepatitis C virus (HCV) were introduced, conflicting data emerged about the risk of hepatocellular carcinoma (HCC) after interferon (IFN)-free treatments. We present a case of recurrent, extra-hepatic HCC in a liver-transplanted patient soon after successful treatment with DAAs, along with a short review of literature. Case Presentation: In 2010, a 53-year old man, affected by chronic HCV (genotype 1) infection and decompensated cirrhosis, underwent liver resection for HCC and subsequently received orthotopic liver transplantation. Then, HCV relapsed and, in 2013, he was treated with pegylated-IFN plus ribavirin; but response was null. In 2014, he was treated with daclatasvir plus simeprevir to reach sustained virological response. At baseline and at the end of HCV treatment, computed tomography (CT) scan of abdomen excluded any lesions suspected for HCC. However, alpha-fetoprotein was 2.9 ng/mL before DAAs, increasing up to 183.1 ng/mL at week-24 of follow-up after the completion of therapy. Therefore, CT scan of abdomen was performed again, showing two splenic HCC lesions. Conclusions: Overall, nine studies have been published about the risk of HCC after DAAs. Patients with previous HCC should be carefully investigated to confirm complete HCC remission before starting, and proactive follow-up should be performed after DAA treatment. During the interferon (IFN) era of chronic hepatitis C treatment, it was almost unanimously accepted that sustained virologic response (SVR) provides reduction of hepatocellular carcinoma (HCC), even though mortality due to HCC still remained almost 25-fold higher in patients who eradicated hepatitis C virus (HCV) than in HCV negative people (1, 2). With the advent of directly acting antivirals (DAAs), some conflicting data have emerged about an increased risk of HCC after IFN-free treatments, provoking a huge debate among the scientific community (3, 4). More specifically, some authors found unexpected high rates of de-novo or recurrent HCC after DAA treatment whereas other authors did not find any significant risk (5, 6). A similar dichotomy affected also data about risk of HCC after DAAs in liver transplanted patients (7, 8). We aimed at contributing to the debate with presenting a case of recurrent, extra-hepatic HCC in a liver-transplanted patient soon after successful treatment with DAAs. Furthermore, we provide a short review of all cohort studies or case series that evaluated incidence of HCC after DAA treatment in the IFN-free era. In 2010, a 53-year-old diabetic man, affected by chronic HCV (genotype 1) infection and decompensated liver cirrhosis, underwent liver resection for HCC (already treated with successful transarterial-chemoembolization) and received subsequently a liver transplant from a HBcAb-positive donor. Importantly, at time of transplant, no residual foci of HCC were present. Then, HCV relapsed and, in 2013, a liver biopsy showed overall inflammation grade 6 and fibrosis stage 1 (Ishak’s classification). In the same year, he was treated with pegylated-IFN plus ribavirin; but response was null. In 2014, he was treated with daclatasvir plus simeprevir as part of an expanded access program (9) for 24 weeks to reach SVR. At baseline and at the end of HCV treatment, the patient underwent computed tomography (CT) scan of abdomen, which excluded any suspected lesions. However, alpha-fetoprotein that was 2.9 ng/mL before DAA increased up to 183.1 ng/mL at week-24 of follow-up since ending DAA. Therefore, CT scan of abdomen was repeated, showing two splenic lesions suggestive for HCC (Figure 1). Sorafenib was initiated. This treatment is still ongoing at time of paper submission. 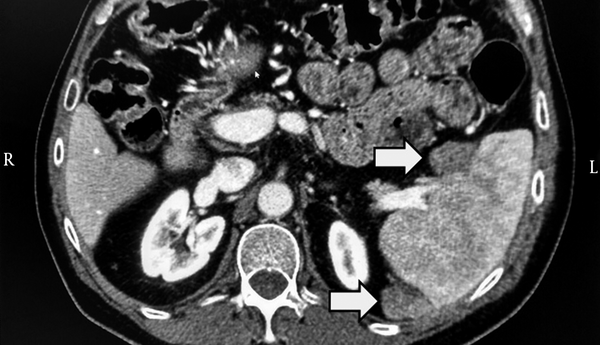 The image shows two solid-vascularized lesions of circa 2 × 2 cm at the splenic hilum and posterior extremity of the spleen. The two grey arrows indicate the two malignant lesions. This case provoked our interest and, for this reason, we updated our knowledge by reviewing all cohort studies or case series, which evaluated the risk of development of HCC in patients treated with IFN-free regimens published from January 1st, 2016 to August 15th, 2016. Overall, we reviewed nine published or accepted articles (Table 1) (5-8, 10-14). It is difficult to find consistent data about the incidence of HCC after HCV treatment because these studies have different inclusion criteria and designs. There are also intrinsic limitations. Moreover, it is possible that some patients received DAAs too early after treatment for HCC, so, at least in some cases, HCC was already present before DAAs but not detected because of limitations in the resolution of imaging techniques. For the same reason, we cannot exclude, also in our case, the possibility that HCC was still growing in the time frame between transplant and HCV treatment but its size was too small to be detected by CT scan. However, since liver transplant occurred five years before HCC recurrence and HCC recurrence happened soon after HCV virological response, the role of DAA treatment in promoting proliferation of neoplastic cells may be hypothesized. aAll patients had decompensated cirrhosis. bPatients received DAA treatment before liver transplant. cReference (9) comprised data from three different cohorts. dAuthors estimated a frequency of HCC recurrence of 6.6-5.2% after DAA treatment. eAll patients had a recent history of HCC within 2 years from HCC treatment (radio-frequency ablation). f38/926 (4.1%) were treated with IFN based treatments, 26/38 (68%) had HCC recurrence. Only two cohort studies have evaluated the risk of HCC in patients who received liver transplant, showing inconsistent results. Yang JD et al. (7) found that, among patients who received DAA treatment before liver transplant, HCC recurrences were more frequent than in transplanted patients who did not receive HCV therapy [5/18 (27.5%) vs. 6/63 (9.5%), P = 0.06]. Moreover, early HCC recurrences (i.e., within 6 months of liver transplant) occurred more frequently among DAA-treated than non-treated patients [4/5 (80%) vs. 2/6 (33%)]. Notably, all DAA-treated patients with HCC recurrence had extra-hepatic lesions, which is consistent with what happened in our case. By contrast, data on transplanted patients from a French cohort (8), showed an incidence of HCC recurrence in only 2.2% cases (7/314) when DAA treatment was prescribed. Differences in the sample size and characteristics of the patient population and treatment strategy (DAA prescribed before or after liver transplant) may explain this apparent discrepancy. Although the risk of HCC after DAA is of great concern because it may suggest a pro-oncogenic role of DAAs (15), it is somehow reassuring to see that this risk is mainly affecting patients with a previous HCC. Indeed, Cheung MCM et al. (5) found that 2/29 (6.8%) patients with previous HCC had recurrences while 15/377 (3.9%) patients without previous history of HCC had primary HCC diagnosis. Similarly, Conti et al. found that 17/59 (28.8%) patients had HCC recurrences while 9/285 (3.16%) patients had a primary HCC diagnosis (13). To explain why some people develop HCC after DAA treatment, only speculative hypotheses can be made. One is that DAAs cause a deregulation of immune-system through an abrupt reduction in the HCV load, leaving immune-cells less active against tumor cells already present at the beginning of antiviral treatment. In fact, HCV infection leads to IFN production that is able to directly eliminate neoplastic clones through a modulation of the inflammatory milieu and activate natural killer cell/cytotoxic T lymphocytes mediated cytotoxicity (1, 2). This scenario suggests that HCV infection works as “adjuvant” for anti-cancer immune response. Moreover, during treatment with DAAs, the immune cell-dysfunction persists also after successful HCV treatment with IFN-free regimens (16). For the same reasons, it may be hypothesized that, while exogenous IFN used as part of HCV treatment plays a protective role in HCC because it “switches-on” inflammatory cells with pro-apoptotic and anti-tumoral activities (17), IFN-free treatments eradicate HCV more easily but neoplastic clones continue to replicate in a setting of reduced inflammation because DAAs eliminate HCV from cells without cleaning them out. In our case, IFN-based treatment prescribed in 2013, could have delayed HCC recurrence. Thus, we speculate that a “tail” of IFN after HCV eradication with DAAs could “re-activate” the immune response against neoplastic clones, replacing the adjuvant effect of HCV infection on anti-cancer immunity (18). Consistently, all data favor a reduced HCC risk after HCV eradication through IFN-based regimens. Unfortunately, this approach appears less applicable to transplanted patients because of high risk of graft rejection with IFN. Our case also raises the issue of how to optimize HCC surveillance after DAA treatment. In our case, the increase of alpha-fetoprotein was the first signal. Although alpha-fetoprotein is not recommended for surveillance (19), in the absence of new markers and scoring systems (including pharmacogenomics (16)), we feel that both imaging and alpha-fetoprotein are useful in these at risk patients. In conclusion, our case and review of the literature support the idea that DAA treatments do not abrogate or even increase the risk of HCC recurrence in short-term. Therefore, potential mechanisms should be further investigated. In the meantime, patients with previous HCC should receive a proactive work-up to confirm that a complete remission was achieved before the treatment with DAA is given. It is important to highlight was reported to be increased soon after SVR, while subsequent HCV eradication might reduce the risk of recurrent or de-novo HCC. This possible biphasic trend in the risk (i.e., greater soon after HCV eradication, lowering afterwards as HCV damage and fibrosis restore) is consistent with immune-reconstitution phenomenon in other infectious diseases, such as immune reconstitution inflammatory syndrome during infection by human immunodeficiency virus (20). It could be interesting to see whether IFN administration (concomitant to DAA or as a tail after SVR) confers protection against HCC recurrence. In conclusion, in the meantime, while it is not reasonable to delay HCV treatment, residual HCC should be excluded with sensitive methods and a pro-active follow-up should be applied. Authors’ Contribution: Alessio Strazzulla drafted the manuscript; Rosa Maria Rita Iemmolo participated in reviewing the manuscript; Ennio Carbone drafted the manuscript; Maria Concetta Postorino drafted the manuscript; Maria Mazzitelli participated in reviewing the manuscript; Mario De Santis involved in data collection (imaging); Fabrizio Di Benedetto involved in data collection (imaging), Costanza Maria Cristiani drafted the manuscript; Chiara Costa participated in reviewing the manuscript, Vincenzo Pisani participated in reviewing the manuscript; Carlo Torti drafted the manuscript and participated in reviewing the manuscript. Financial Disclosure: All authors declare that they have not any support from any organization for the submitted work. Also, there is no financial relationship with any organization that might have an interest in the submitted work in the previous five years. Moreover, no other relationships or activities that could appear to have an influence on the submitted work are declared. Funding/Support: This study did not receive specific grant from any funding agency in the public, commercial or non-profit sectors.